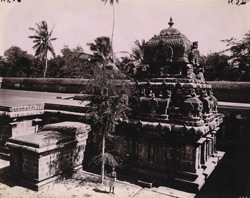 Photograph of the north elevation of the sanctuary of the Ghritapuresvaraswami Temple at Tillaisthanam, Thanjavur District, taken by Alexander Rea around 1892. Tillaisthanam is located in the modern state of Tamil Nadu. The Ghritapuresvaraswami temple is two-storeyed and has a number of features typical of the Muttaraiyar period. This dynasty of rulers flourished just before the advent of the Cholas and built a number of temples in southern India. It has been suggested that the temple could date to the early years of the Chola period or to the Pandya occupation (A.D. 864-878). This is because the temple does not fit easily into a single architectural style, but incorporates features of many different styles. The temple faces east and enshrines a lingam. The tall pyramidal gopura consists of diminishing storeys and ends with a vaulted roof.